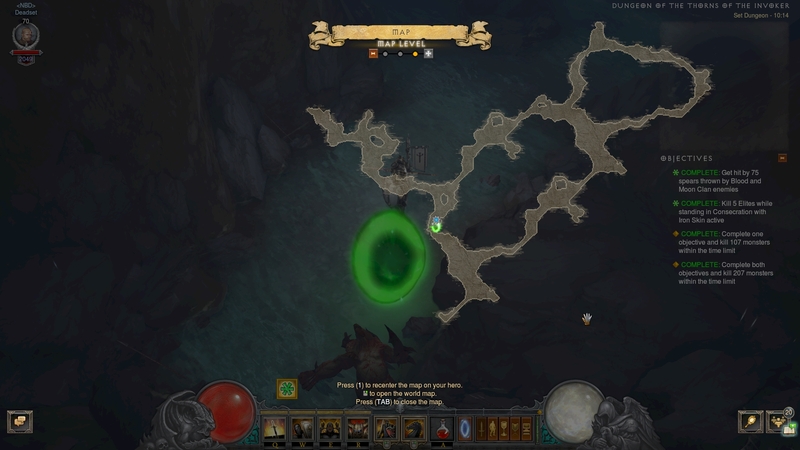 The Invoker Set Dungeon is located in Act I, the Overlook Road. Simply head to the Act I town, New Tristram, and exit from the gate where Diablo 3's campaign starts (the Captain Rumford events). Head up the slope towards the game's starting point, and look behind the overturned cart on the hill. The entrance will appear if you have the Invoker 6-piece bonus equipped. The Invoker Set Dungeon's two unique Primary Objectives are to: 1) Get hit by 75 spears thrown by Blood and Moon Clan enemies; and 2) Kill 5 Elites while standing in Consecration with Iron Skin active. The Invoker Set Dungeon is made of a cave tileset with a twisting, 8-shaped layout. A proven attempt path is to go upwards at the first major intersection, and following the outer edges of the "eight" shape, revealing any minor side areas as you come across them. Blazing Ghouls — they come in great numbers and engage you in melee combat. They provide the main portion of the dungeon's kill count objective, and will likely kill themselves into your Thorns damage. Blood Clan Mauler — similarly to the ghouls, these melee minions will pad out the kill counter. Blood & Moon Clan Impaler — these spear-tossing goatmen are necessary for the first Primary Objective, and their low health is a major reason to tone down your Thorns stat during the attempt. Champion of Thorns — the unique enemies on the map. They resemble Act 3's Blood Clan Mauler trash, and are key to the second Objective. They are exactly 5 in number, so be wary of having your Consecration and Iron Skin cooldowns up when you encounter one. You do not need exceptionally high Thorns damage to complete the Invoker Set Dungeon — it will, in fact, be to your detriment to maximize Thorns because you will start oneshotting the Blood & Moon Clan Impalers. Anywhere in the 100-150,000 Thorns is a safe sweetspot of 2-3 spears shots per goatman, while maintaining good killing speed. Blood & Moon Clan Impalers mostly come in their own tiny packs, so when you see them ahead, simply stop in place and allow each to toss a few spears (stopping in one spot helps because their projectiles can miss). This will allow you to get through the first Primary Objective by the first third of the dungeon, allowing you carefree killing of those packs for the rest of the attempt. Using an In-geom (either in hand or cubed) and an Akarat's Awakening in your off-hand will help you reset the important Consecration and Iron Skin cooldowns for each Elite for the second Objective. Do not use those cooldowns for any other enemies, as it will not be necessary and will put the attempt at risk. If you see an Elite nearby and the CDs are not up, disengage to a safe distance and wait them out without attacking — the Invoker set has a damaging aura. When you're right next to the Elite, activate Consecration and Iron Skin in quick succession and in that order — the weaker Bed of Nails doesn't have the oneshotting potential of Reflective Skin. Follow their activation with a quick Punish swing to seal the kill during their uptime. Unlike normal Invoker setups, using Belt of the Trove is not recommended to avoid any Bombardment mishaps as you setup a proper Elite kill for the second Objective.